Both Marines died when their vehicle was struck by an improvised explosive device while conducting combat operations against enemy forces near Al Amariyah, Iraq on October 21, 2005. Their vehicle was traveling beside a canal when the attack occurred and the two Marines were thrown from the vehicle into the water. They were assigned to the 2nd Battalion, 2nd Marine Regiment, 2nd Marine Division, II Marine Expeditionary Force, Camp Lejeune, North Carolina. Captain Tyler B. Swisher, who put in extra effort to become a successful student and then a U.S. Marine officer, was killed by a roadside bomb in Iraq, the Defense Department said Wednesday. 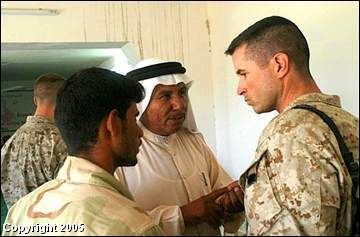 Swisher, 35, of Cincinnati, was killed last Friday in Al Anbar Province, military officials said. Corporal. Gray Cockerham III of North Carolina also was killed by the explosion that threw them from their vehicle into a canal, where their remains were eventually recovered as fighting continued in the area. Swisher, the 94th Ohioan killed in the Iraq war, is survived by a wife and three children who live in the Camp Lejeune, North Carolina, area. His parents live in eastern Cincinnati. "I've always heard that expression 'a Marine's Marine.' That was Tyler Swisher," said Jack Buchholz, a longtime family friend serving as the family's spokesman. He and Tyler's father, David, were teachers in the suburban Indian Hill school system. "He overcame a lot of obstacles. He had to work extra hard," said Buchholz. He said Swisher had a learning disability and spent hours on his studies, but kept improving and made the honor roll his senior year. Small while in high school, he was on the football team his senior year at Mariemont but rarely got into games. He went on to earn a biology degree from Butler University in Indianapolis, then decided to enlist in the Marines in 1993. He trained for six months just to make sure he was ready for boot camp, Buchholz said, working construction, running miles each day and climbing a 20-foot rope to gain strength. He worked his way up to officer's commission in 1997, and was a company commander for the 2nd Battalion, 2nd Marine Regiment, with 200 Marines in his command. Buchholz said Swisher was in his third tour of Iraq duty. He and his wife Stephanie bought a home in North Carolina this year, Buccholz said. He leaves behind daughters Ashleigh, 15, and Madison, 7, and a 5-year-old son, Jacob. His parents, David and Mary Beth, were notified Monday night. Memorial services will be scheduled later, with burial to follow in Arlington National Cemetery. A memorial for a Marine killed in Iraq will take place at a local church. Captain Tyler Swisher will be honored at a service at Crossroads Community Church, 3500 Madison Ave., and his remains will be buried at Arlington National Cemetery. 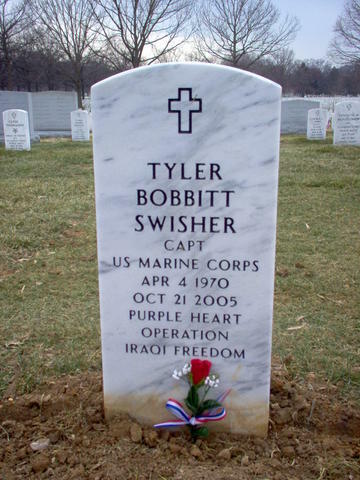 Swisher was killed when a roadside bomb hit his convoy on October 21, 2005. He leaves behind a wife, two daughters and a son, who live near Camp Lejeune, North Carolina. Swisher is a graduate of Mariemont High School and Butler University in Indianapolis. Contributions to the Capt. Tyler Swisher Childrens Memorial Fund can be made at any local Fifth Third Bank. All proceeds will go toward funding his children's college education. 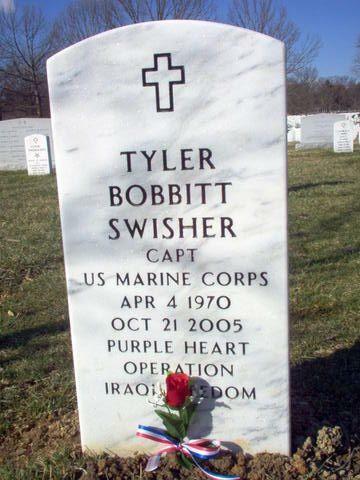 A memorial service will be held Tuesday for Marine Captain Tyler B. Swisher, who was killed October 21, 2005, by an improvised bomb during combat in Al Anbar province in Iraq. Swisher, 35, was about halfway through his third tour of duty in Iraq when he was killed. Swisher's body will be returned to Cincinnati today. A processional march will leave from Witt, Good and Kelsch funeral home, 3026 Madison Road, in Oakley at 2:30 p.m. Tuesday and go to Crossroads Community Church at 3500 Madison Avenue. Memorial services will be at 3 p.m. at the church. The family has invited the public to the services. Swisher, a graduate of Mariemont High School, will be buried Thursday at Arlington National Cemetery. His parents, Dave and Mary Beth Swisher, live in Pierce Township His wife Stephanie and three children, Ashleigh, 15, Madison, 7, and Jacob, 5, live near Camp Lejeune, North Carolina. holds on to Marine Captain Gary McCullar outside Crossroads Community Church before her husband's funeral service Tuesday. 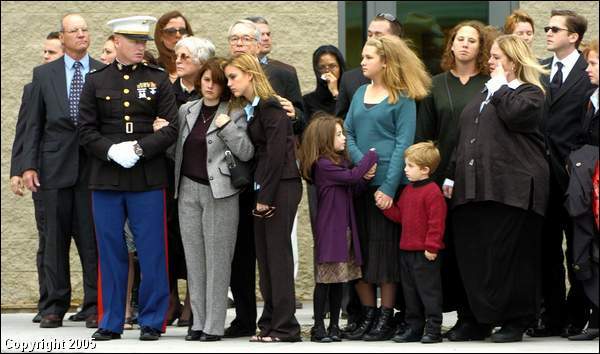 Fellow Marines bear Captain Tyler Swisher to a waiting hearse. 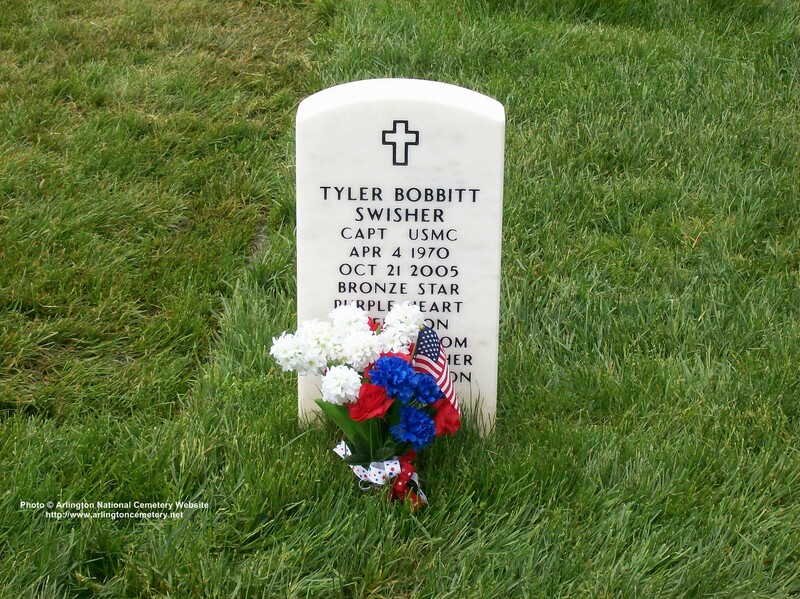 The Mariemont native will be buried at Arlington National Cemetery. A family photo of Captain Tyler Swisher, who was in his third tour in Iraq. U.S. Marine Captain Tyler Swisher craved challenges that others shunned. His arduous training in Korea for mountain warfare involved climbing steep, rocky slopes and living outdoors in the harsh elements. 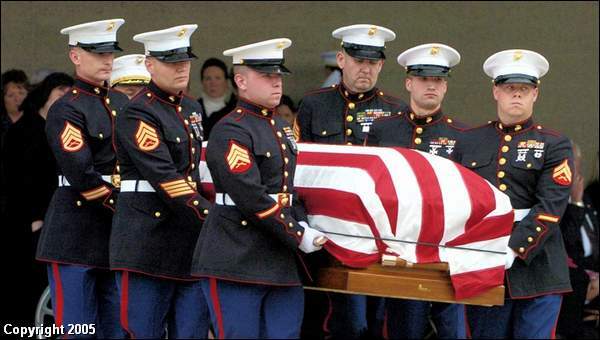 "It was miserable," recalled his fellow Marine and close friend, Captain Gary McCullar. "He loved it." Swisher's family and friends laughed knowingly when McCullar told that story Tuesday at Swisher's funeral at the Crossroads Community Church in Oakley. From the time he was a skinny, 100-pound football player at Mariemont High School through his third tour of duty in Iraq, Swisher pushed himself beyond the norm. "Tyler never faltered," McCullar said. "He always did it right." Swisher, 35, was killed Oct. 21 by a roadside bomb in Iraq. The Mariemont native will be buried at Arlington National Cemetery on Thursday. He leaves his wife, Stephanie, and children, Ashleigh, Madison and Jacob. The family lives in the Camp Lejeune. N.C., area. His also leaves his parents, David and Mary Beth Swisher; his brother, John; and his sister, Sara. A mile-long funeral procession from the Witt Good & Kelsch Funeral Home on Oakley Square to the Crossroads Community Church at Madison and Ridge roads preceded the church service. Swisher graduated from Butler University in Indianapolis in 1993. Swisher, who grew to be 6-foot-2 and 210 pounds, enlisted in the Marines 12 years ago. More than 300 people attended the funeral service in the large auditorium of the Crossroads Community Church. "He gave everything he had so that everyone he loved and his fellow Americans could live free from fear," said Army Brig. Gen. Jeff Foley, also a Mariemont High School graduate. Foley, who is older than Swisher, had never met him. 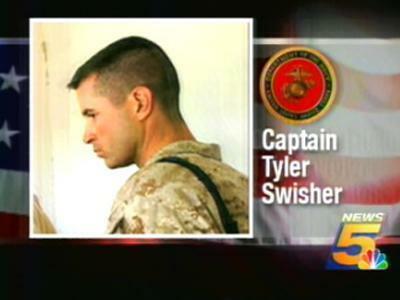 But he said he learned a lot about Swisher by talking to family members, friends and his fellow Marines over the past three weeks. Swisher was an unselfish person who always placed the needs of his family, his friends, the Marines he led and his country above his own, Foley said. "It was never about him," Foley said. "Wars are fought by many. But they are won by men like Tyler."